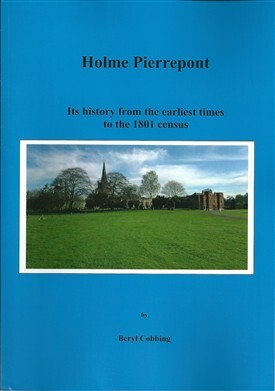 This book follows the lives of the men and women who lived and worked in the parish and manor of Holme Pierrepont from medieval times to the first national census. Archaelogical evidence indicates signs of early human activity in the Holme Pierrepont area; a permanent Anglo-Saxon settlement was well established before the Norman conquest. At the end of the 13th century the Pierrepont family became lords of the manor. Having 288 pages it is a fascinating read with many colour photographs and illustrations. To buy a copy of the book please send a cheque made out to Radcliffe on Trent Local History Society for £14 plus £8 postage and packing (within the UK) to: Beryl Cobbing, 25 Main Road, Radcliffe on Trent, Nottingham NG12 2BE , enclosing your name, delivery address and a contact telephone number and / or email address. This page was added by Marion Caunt on 11/12/2012.